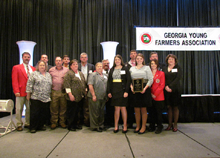 2014 DEKALB Agricultural Accomplishment Award--Last Call! Last call for the Dekalb Agricultural Accomplishment Award! Please submit your nominations no later than May 6, 2014. The DEKALB® Agricultural Accomplishment Award is annually presented to one FFA student per chapter because they exemplify scholarship, commitment and work ethic. In 2014, DEKALB is celebrating our 67th year of sponsorship of this award. Teachers must nominate a student. All nominations should be directed to the award email box: dekalb.agaccomplishment@monsanto.com by May 6. All nominations should include the recipient name, banquet or presentation date, the FFA Chapter/Name of School, and the name and address for shipping. Winners receive a commemorative award certificate, a lapel pin, and a congratulatory letter from the DEKALB Brand Lead. Please allow a minimum of 15 business days for shipping. 2014 CASE Institutes--Sign Up Today! CASE Institute season is fast approaching, and time and seats are limited! There are still a few seats available for almost all courses this summer. Seats have also opened up in some previously full institutes. Check out the CASE website at www.case4learning.org to secure your spot now! NAAE is partnering with Catholic Relief Services (CRS), which is the lead organization, on a Farmer to Farmer (F2F) Program supporting East Africa. CRS is implementing this new five-year program to promote sustainable economic growth, food security and agricultural development in Kenya, Uganda, Ethiopia and Tanzania. CLICK HERE FOR MORE INFORMATION, INCLUDING ADDITIONAL RESOURCES, AND TO VOLUNTEER TO PARTICIPATE IN THIS PROGRAM. The NAAE Virtual Book Club is designed for agricultural educators to personalize their professional development. NAAE members can participate in the Virtual Book Club and earn up to 5 hours of professional development credit or CEU's. This summer, the NAAE Virtual Book Club will read The Fundamental 5: The Formula for Quality Instruction by Sean Cain and Mike Laird. CLICK HERE FOR MORE INFORMATION AND TO REGISTER FOR THE NAAE VIRTUAL BOOK CLUB. From the President- Will Our Story Be Told? Whose job is it to get us there? Is it my job, is it the NAAE's job? Is it your job, or is it your students' and community's responsibility? I believe the answer is all of the above. If one part is missing, then we loose an important spoke in the wheel of success. 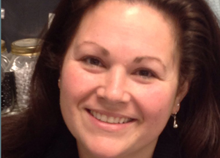 2014 NAAE Advocacy Video Challenge WINNER! 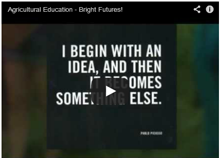 Congratulations to students in the agricultural education program at Somonauk High School in Somonauk, Ill., for producing the winning video in our 2014 advocacy video contest! The winning video, Somonauk High School – Bright Futures was created by students Jenna Baker, Monica Loy and Alex Dale under the direction of their teachers Toni Saso and Riley Hintzsche. Click the link to watch the winning video and see our honorable mentions. Ag Ed Without Advocacy: Missing Something? “So who’s ready to advocate for public education?” I asked at a recent meeting…I waited and heard crickets, literally, since we were meeting in my classroom and that is what the lizards eat. Nobody moved. Eyes started to stare at the floor. Coughs started - the kiss of death when a topic has been broached! The 2014 ACTE National Policy Seminar proved to be an exciting opportunity for agriculture teachers across the U.S. to advocate for school-based agricultural education. Twenty-three states were represented by agriculture teachers with 46 participants in the Ag Ed Strand of the seminar. Many times agriculture teachers struggle with the financial challenge of teaching in a small community. It can be hard to find resources to expand a program, making growth seem at times like an unachievable goal. For Ron Bray, this has never seemed to be an issue. The other day I received a request in the mail from an organization that I was involved in during my middle school years. The request was naturally for money to support the organization that “set me on a clear path to success in life”. I barely remember being involved in this group so I tossed the papers in the shred pile. Catch up on what happened at NPS and hear from attendee Sarah Knutson about how this seminar made a difference in her professional life. Looking to advance, revamp, or just begin your Food Science course? The Curriculum for Agricultural Science Education has added another course to its innovative lineup that will provide exactly what you need to offer an exciting, inquiry-based course for your students. Keeping a tidy greenhouse was a major struggle when it came time to fill pots and flats with growing media at Preston High School in Preston, Idaho. Ag Teacher Joshua Evans developed a media table to reduce the mess and speed up the greenhouse clean-up process. Check out how Amy Holder’s influence on agriculture teachers throughout the state of Missouri earned her the Region IV Teacher Mentor award. Her lasting impression has truly made a difference! The XLR8 participants haven’t stopped growing and learning since their first professional development event at the 2013 NAAE Convention. 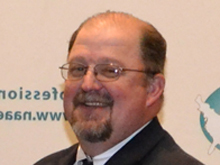 Wes Crawford, agriscience teacher, Sutherlin High School, Sutherlin, Ore., has been selected to receive the George Washington Carver AgriSCIENCE Teacher’s Award in recognition of his teaching excellence. 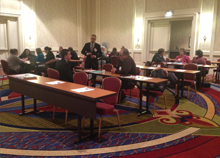 Regional Conferences are a great way to earn professional development. Do you have an advocacy plan? CoP Highlight: Advocate for your Program!! The Legislative Action Center is a great tool to find out about agricultural education-related legislation near you. It even provides contact information for your state and local representatives, so you can voice your opinion! Will Our Story Be Told? Advocacy begins at the local level--agriculture instructors just doing what we do best, is the beginning. Teaching students about agriculture, taking students through career exploration in agriculture, teaching leadership skills, and providing opportunities for student recognition will produce advocates for agricultural education. Successful career and college ready students are the best advocacy tool we can bring to the table. Where and to who do we tell that story? We yell it to anybody that will listen! It is a story that parents, local businesses, legislators, school administrators, school faculty, and media must hear. When they see and hear our story, then they become advocates for agricultural education. Advocacy is something we are doing when we put articles in the newspaper, hold our end-of-year banquet, and meet with our advisory group. At that level it comes easily; we are in our comfort zone. It is when we step out of that comfort zone that we perceive it being more challenging. Why change what you do best? Your story will work at all levels of advocating. It has the same effect at the local and national levels. The NAAE board and staff are working hard to develop advocacy tools for our members to use. Advocacy lessons have been developed to guide you through the process. These lessons are available to use at the local level to expand your comfort zone. The NAAE board continually collaborates with other agriculture organizations to identify strong messages for agricultural education. The NAAE board will always promote agricultural education, but the local voice will always be louder and stronger than ours. My challenge to you, is just tell the story. Your story will always add spokes to the wheel of success.